Special Event | Click on any image to view larger. 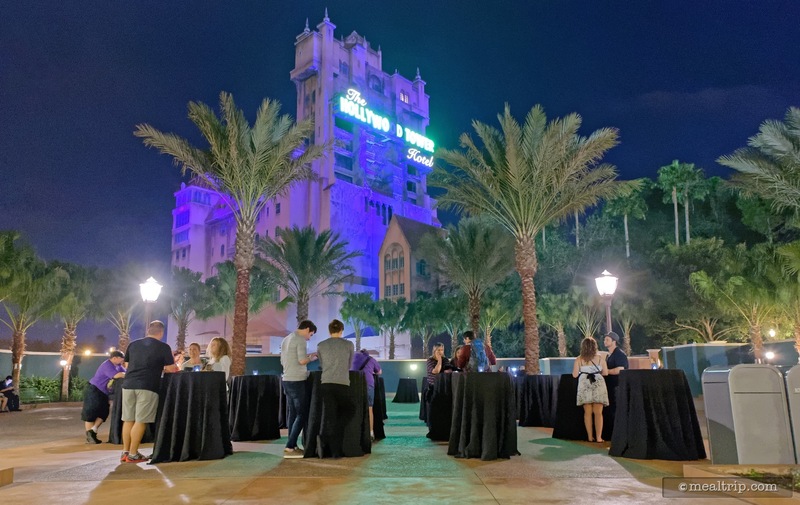 The Club Villain Dining Event at Sunset Showcase listing is a Special Event dining location at Hollywood Studios featuring Cajun - Creole, French, American, Wine, Beer, Spirits or Beverage-based cuisine. There are 69 photos in the Mealtrip photo gallery for this location and dining period. 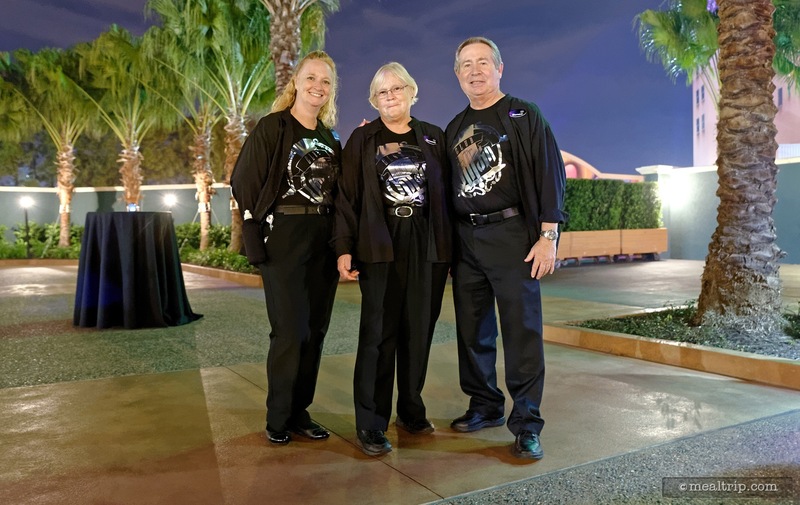 The Club Villain Dining Event at Sunset Showcase listing currently has a score of 93 out of 100. 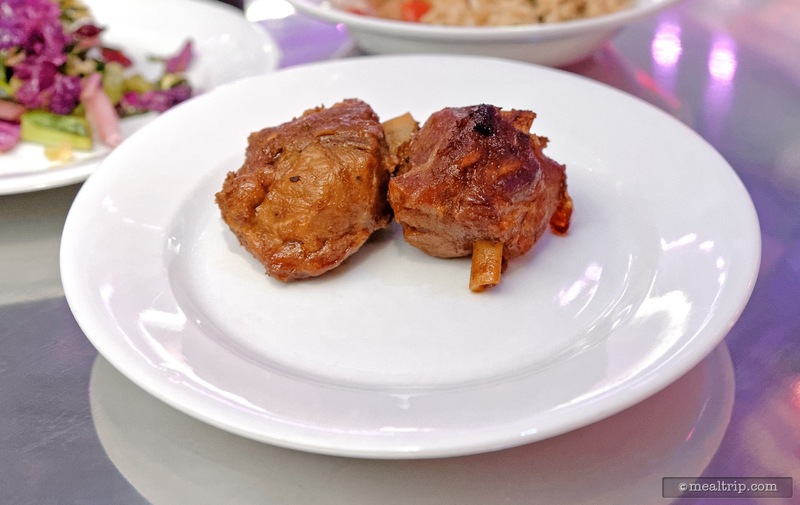 Click here to read all of the reviews for this location, or log in to Mealtrip.com to add your own review for Club Villain Dining Event at Sunset Showcase. 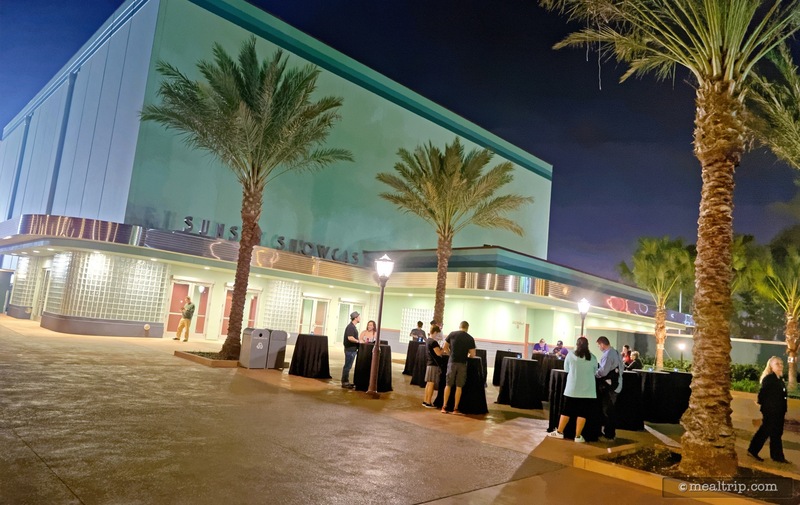 After checking in, the courtyard in front of the Sunset Showcase acts as an outdoor "lobby" of sorts. 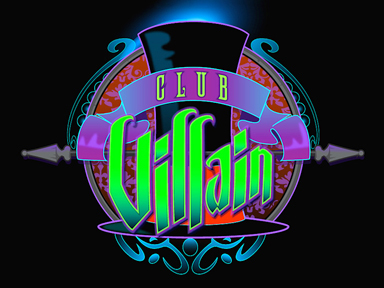 Club Villain has some of the best looking club staff this side of New Orleans! 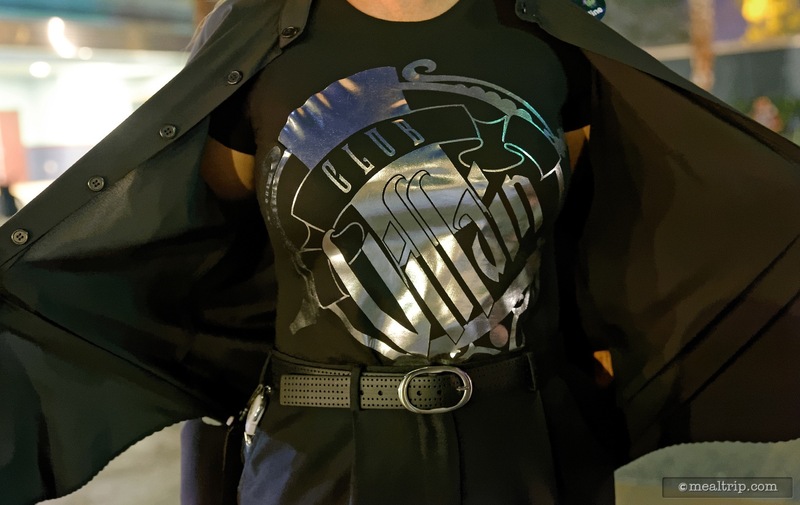 The cool Club Villain t-shirts are for the staff... they're not for sale... yet. 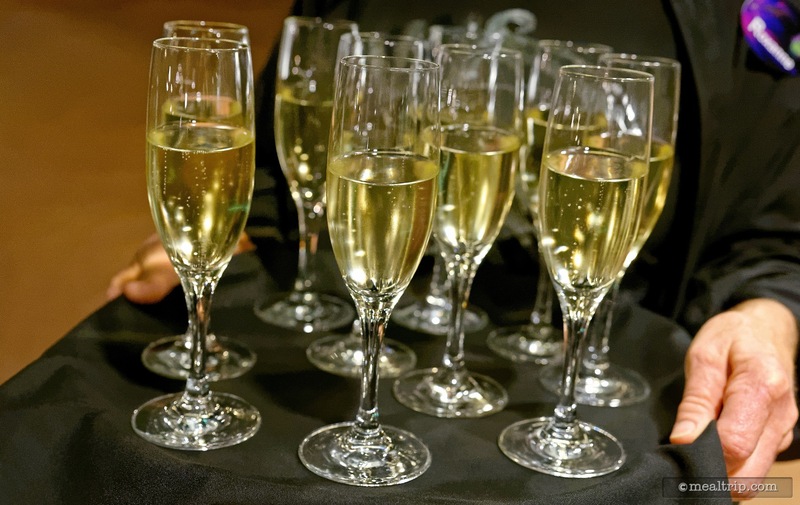 Complimentary sparkling wine and bottled water were being offered while everyone was waiting for Club Villain to open it's doors (yes, they will check your ID). 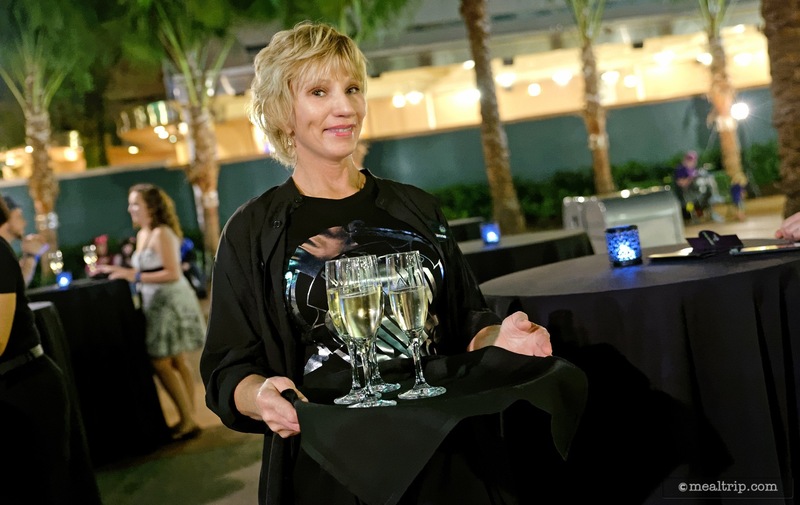 A complimentary flute of sparkling wine (possibly sparkling cider, I wasn't paying close enough attention) and bottled water were also on hand while you wait for Club Villain to open. How can you not love that view? Taken from the courtyard of Sunset Showcase, waiting for Club Villain to open. Club Manager Kanzo opens Club Villain for the first time ever! 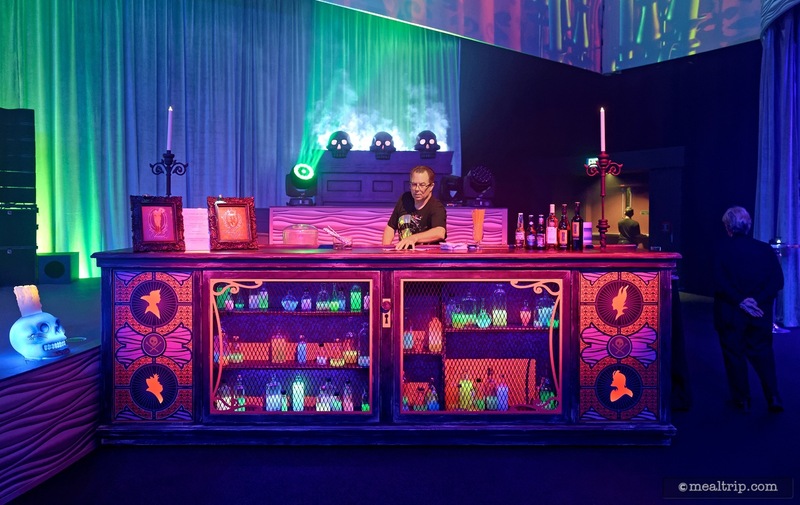 DJ Thibodeaux's station acts as a centerpiece for the stage area. Club Villain quickly fills up as guests enter. 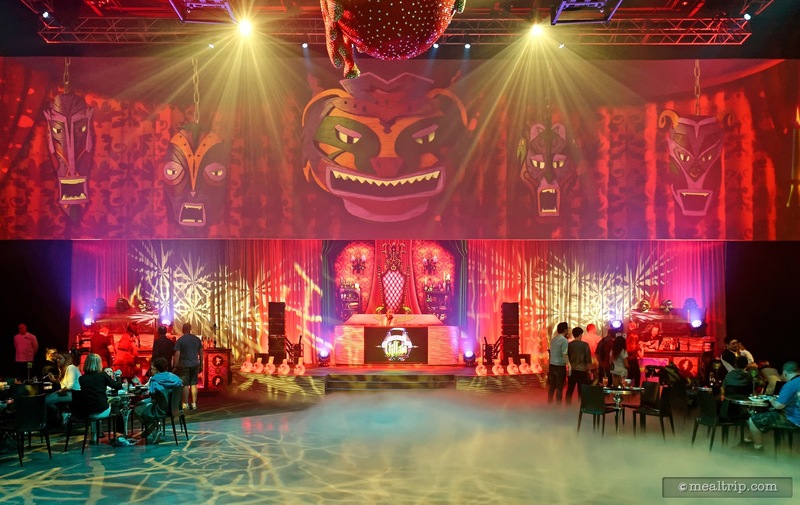 The center of Club Villain features a large performance space that also doubles as a dance floor while the DJ is playing tunes. 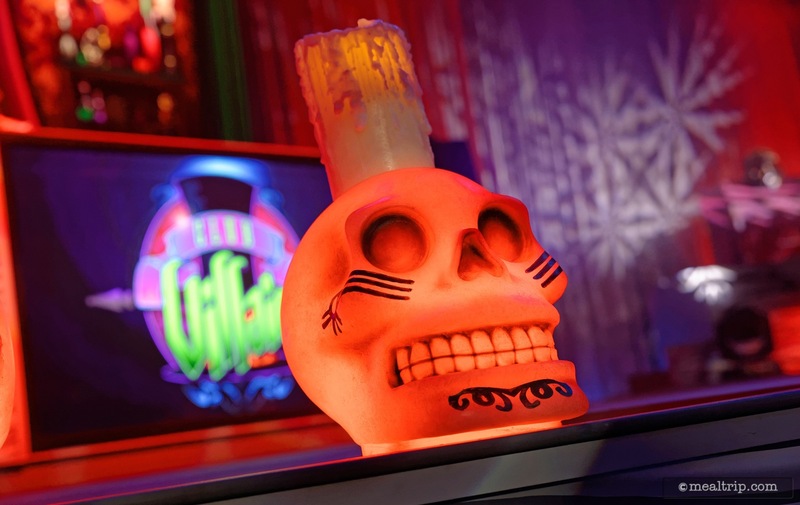 Details are everywhere at Club Villain, like the skull candles that line the stage area. 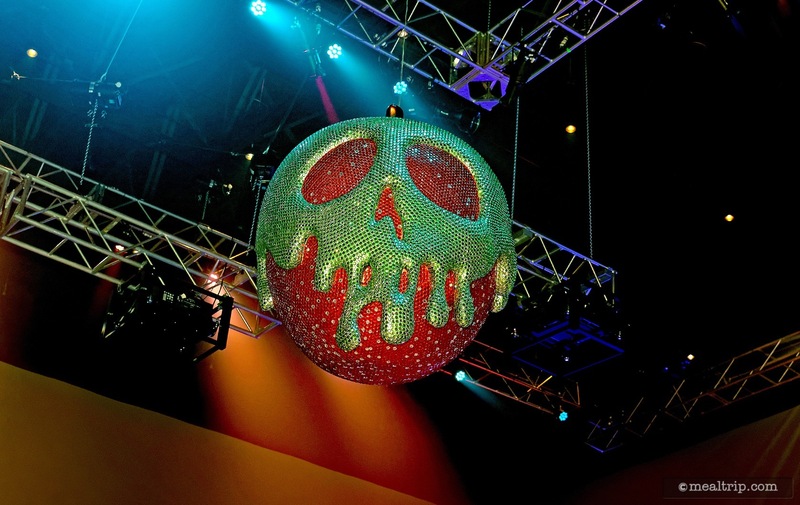 This awesome "poisoned apple" mirror ball proved to be a mesmerizing centerpiece as it rotated high atop the main performance hall. How cool is that thing? Just look at how detailed that bar is! There are two of these bars located on either side of the stage. Savory culinary stations are duplicated on each side of the room, the desserts though, are different on each side of the room. Here, the Polenta and Sauteed Shrimp is being made to order. 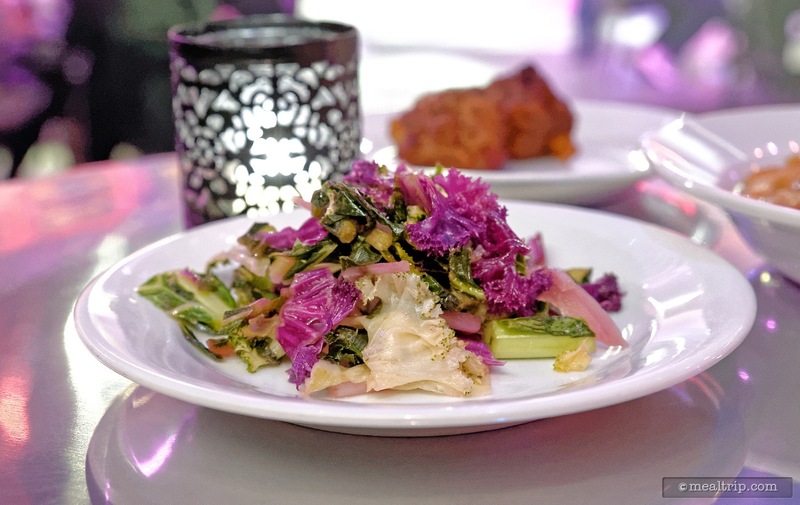 The Vegetarian Kale and Collard Slaw with Watermelon Vinaigrette looks very "New Orleans" with the purple and green components. Very nice touch culinary team! Voodoo Sticky Pig Wings with Citrus Gremolata. 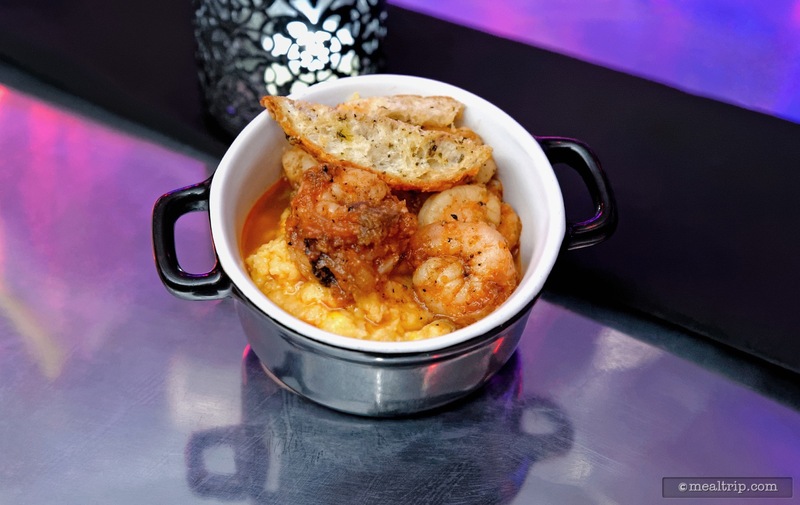 The Sauteed Station featured Creamy Polenta with Fire Kissed Corn, Sauteed Shrimp with Spicy Andouille Sausage, Tomato, Okra, and Onions, along with a couple of Rosemary Crisps on top! 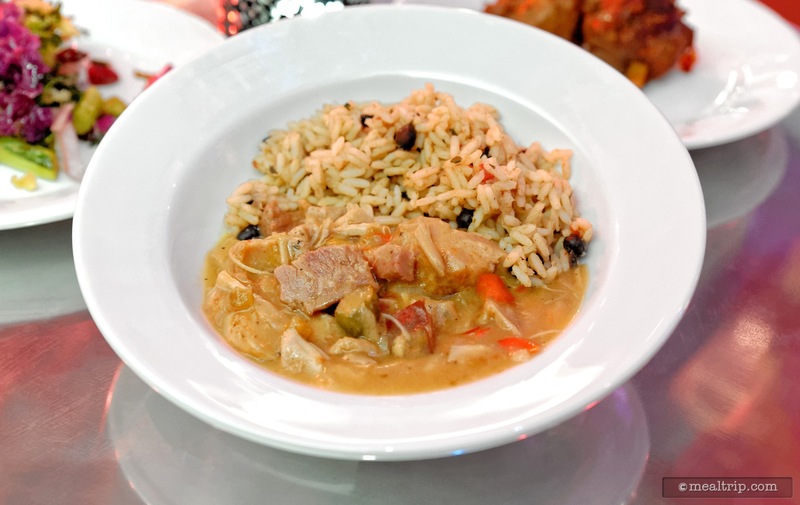 Vegetarian Dirty Rice (at the top of the bowl) and Cajun Chicken Thigh Gumbo (at the bottom, which is NOT vegetarian)... I put the two together... you may not want to if you're a vegetarian. 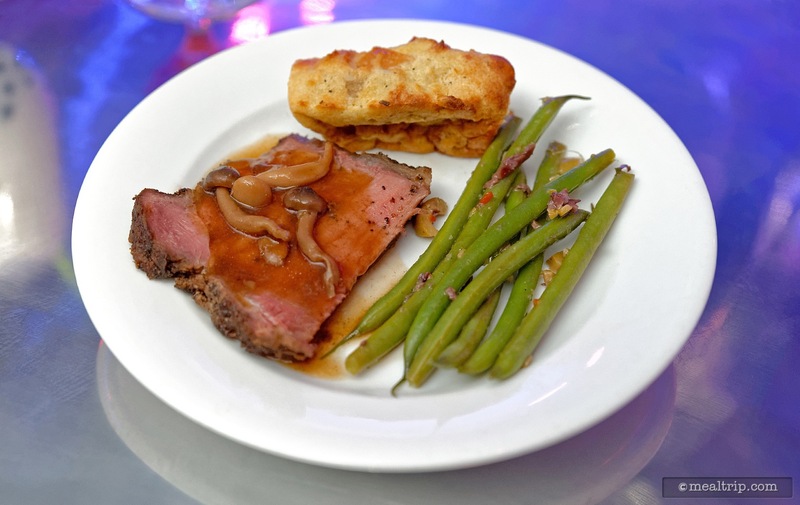 From the top, Bourbon Bread Pudding "Beignet", Chilled Haricot Verts with Muffuletta Vinaigrette, and Rubbed Striploin of Beef with Herbs, Garlic, and Wild Mushroom Demi. 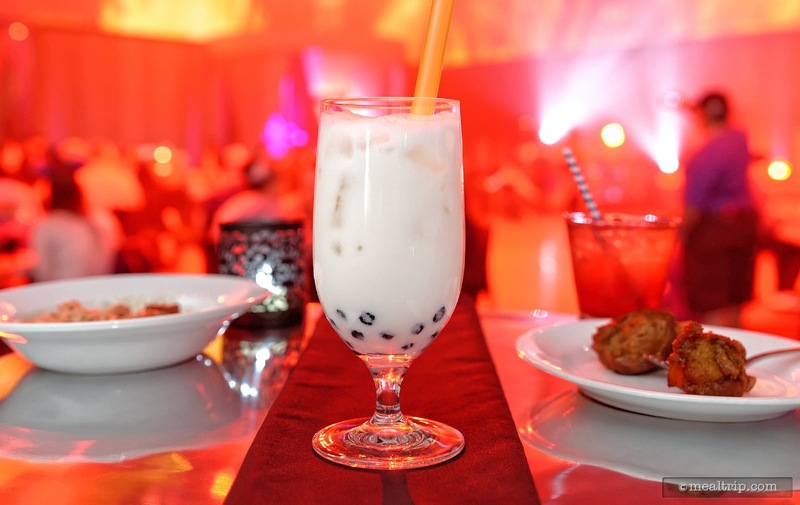 Cruella De Vil's cocktail of choice is the "Devious Dalmatian" which combines Godiva® White Chocolate Liqueur, Milk, and Coconut Milk, Garnished with Boba Pearls. 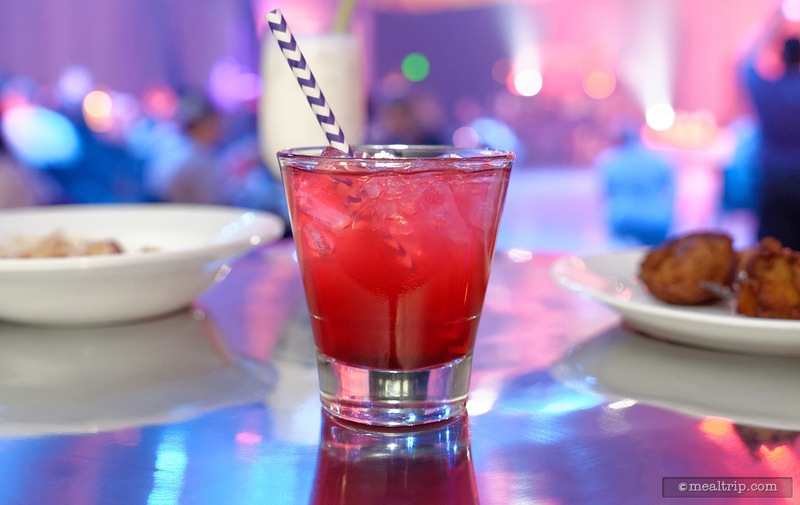 The Cursed Violet is Maleficent's beverage and contains Citrus Vodka, Creme de Cassis, Monin Blackcurrant Syrup, Lemonade. 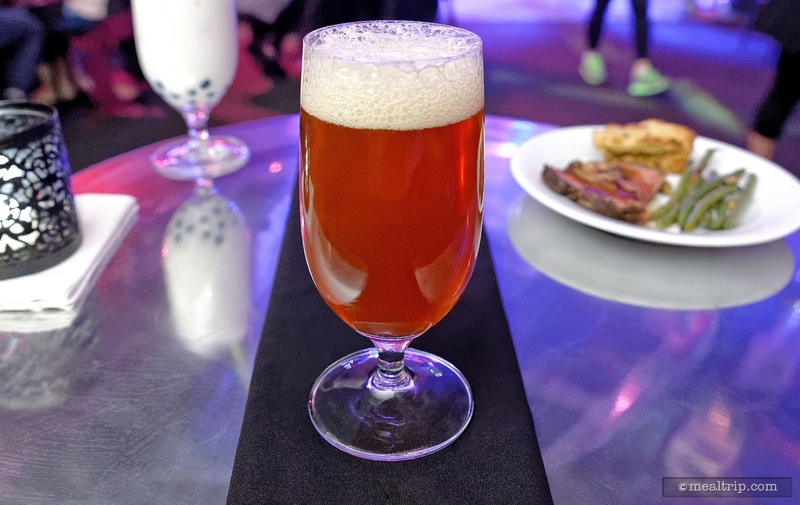 If you're not into the fancy cocktails, several wines and beers are available. Here's a Yuengling with a decent head, in a proper beer glass! 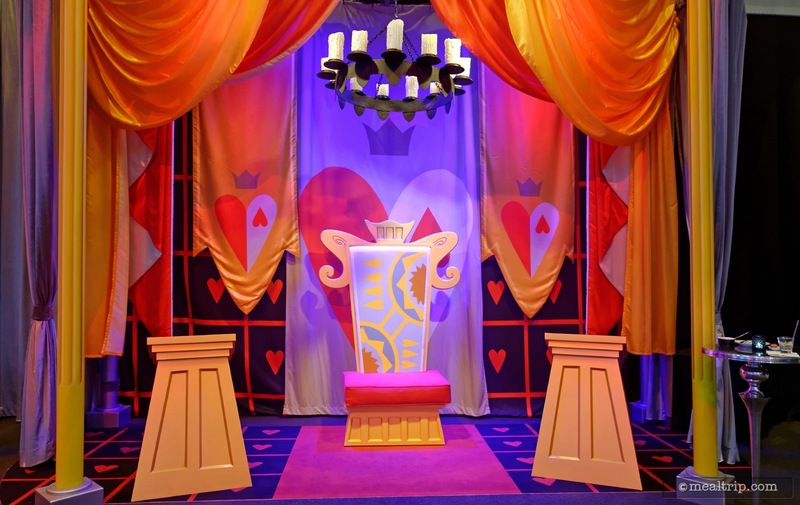 The Queen of Hearts' photo meet and greet area. 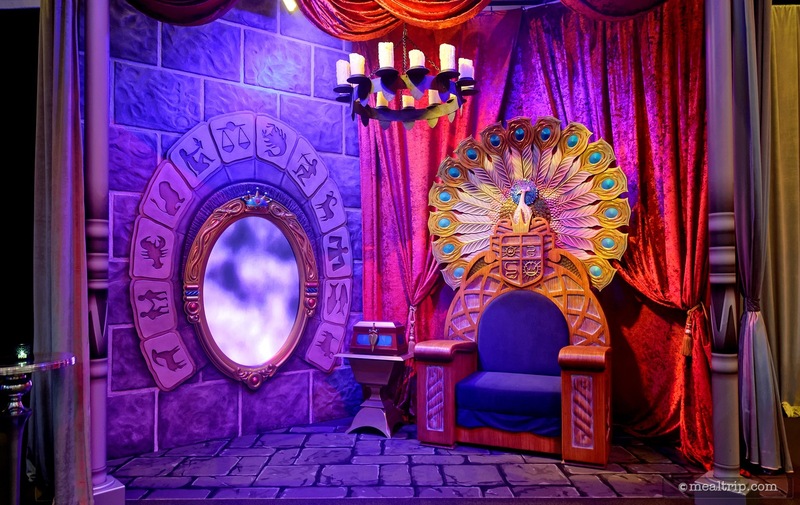 The Evil Queen's photo meet and greet area. 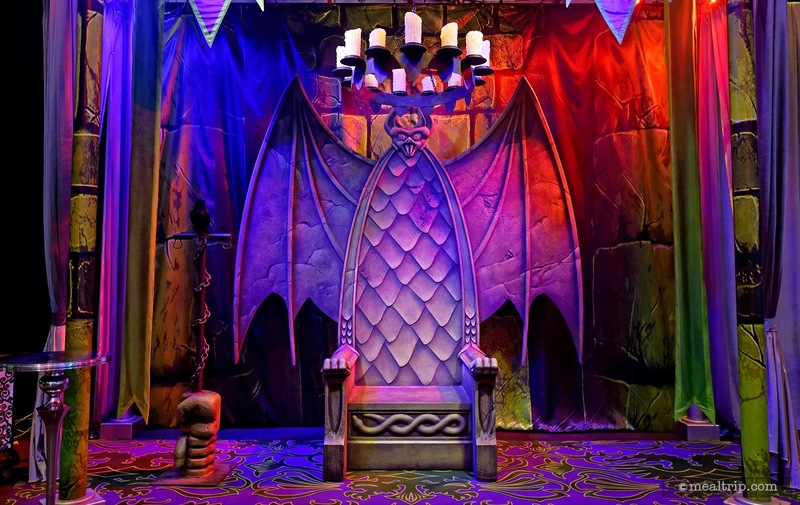 Maleficent's photo meet and greet area. 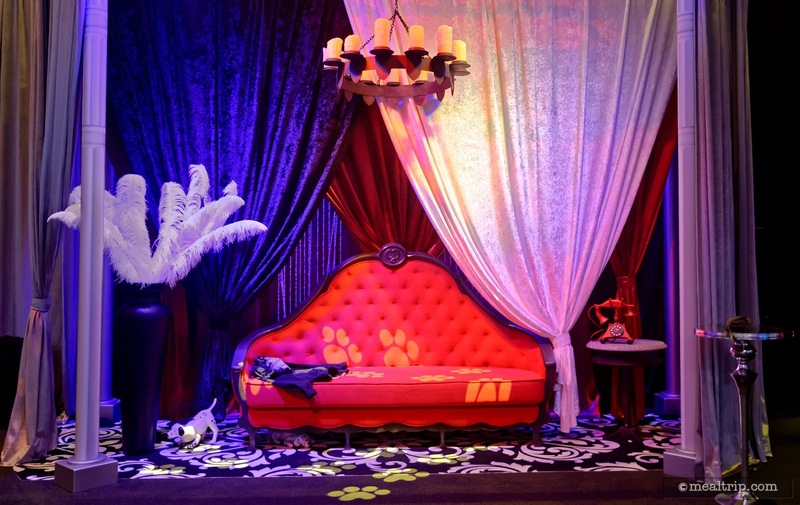 Cruella De Vil's photo meet and greet area. 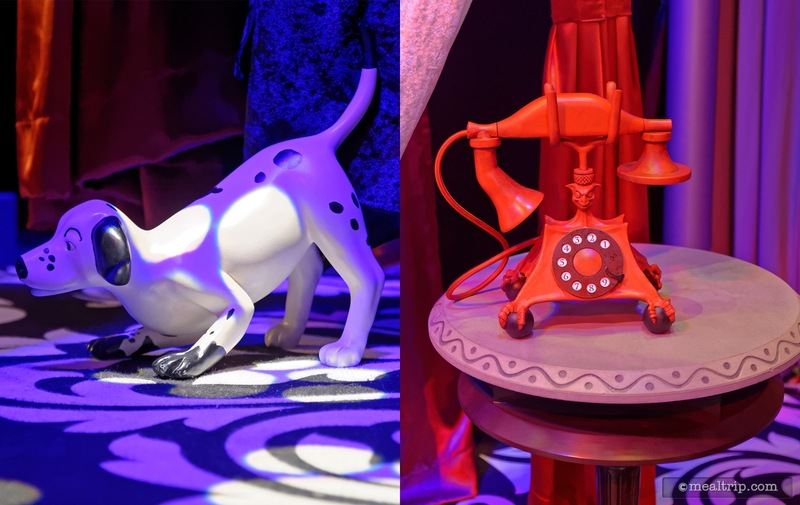 Each of the meet and greet areas feature their own unique details. Check out that phone and table that look like they just came out of the cartoon. 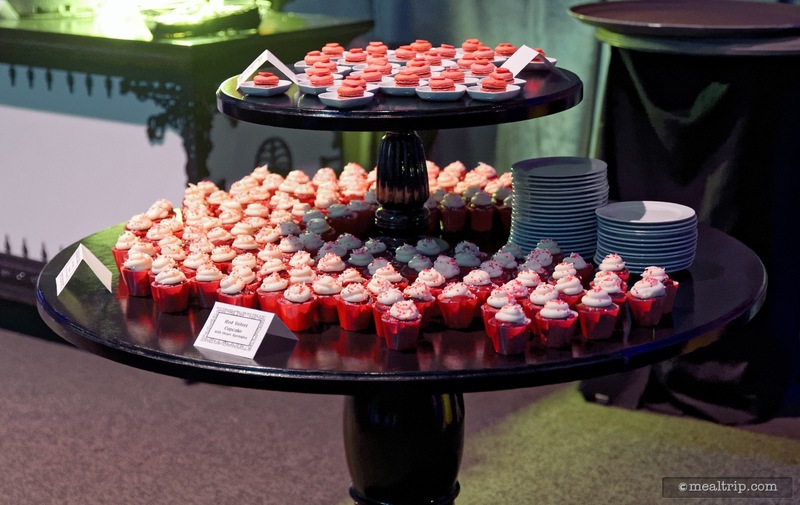 These giant dessert tables are a great idea! Normally, they would have the cupcakes on rectangle plates with tongs... and I could never grab those cupcakes with a tongs! Now it's much easier!!! 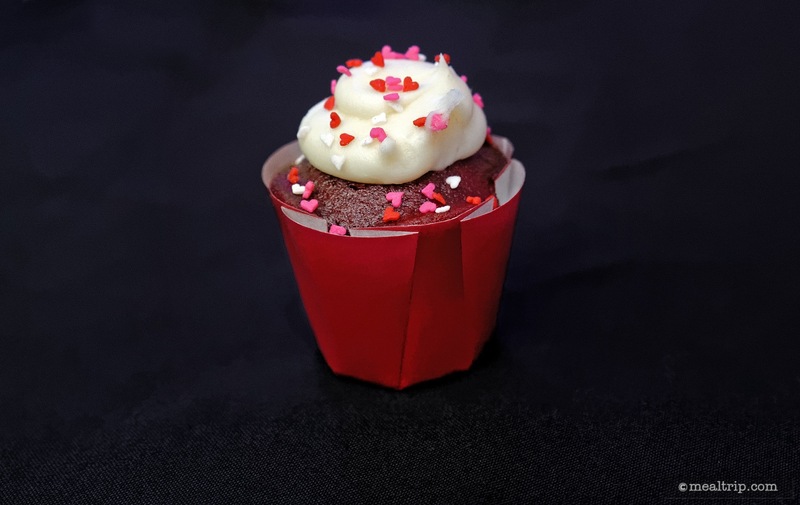 Each Villain has two desserts, here are the Queen of Hearts' Red Velvet Cupcake with Heart Sprinkles. 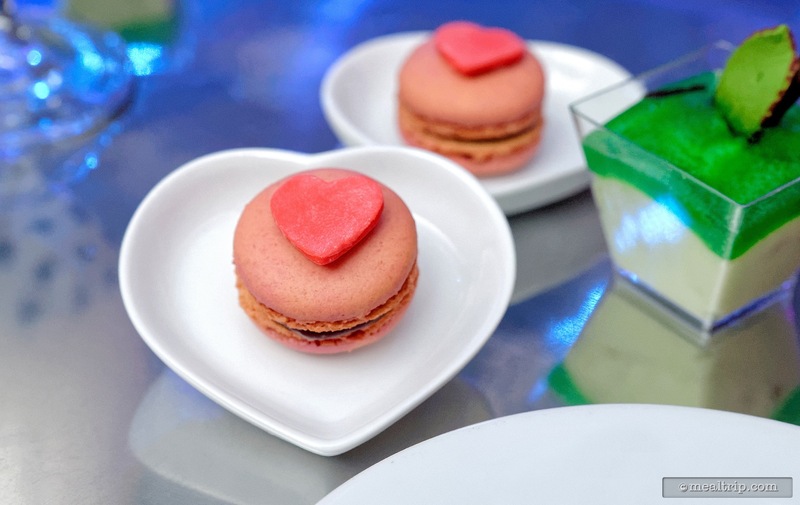 The totally delicious Red Macarons with Red Hearts from The Queen of Hearts dessert station. 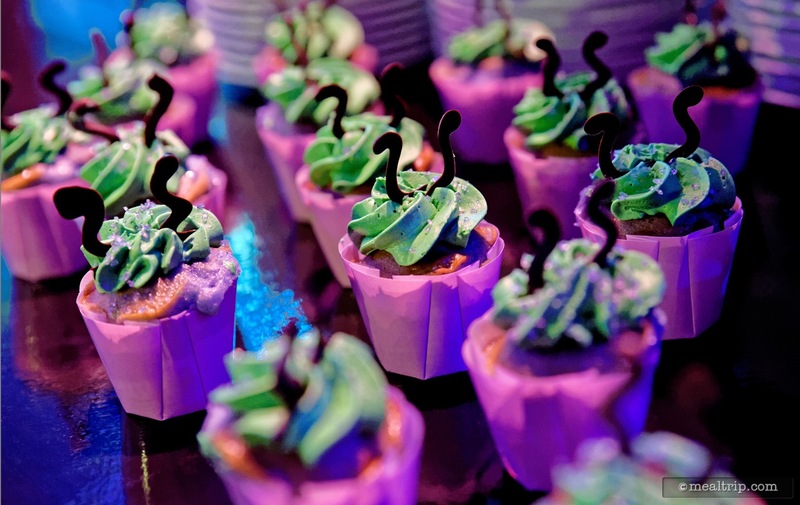 So many evil Maleficent cupcakes!!!! 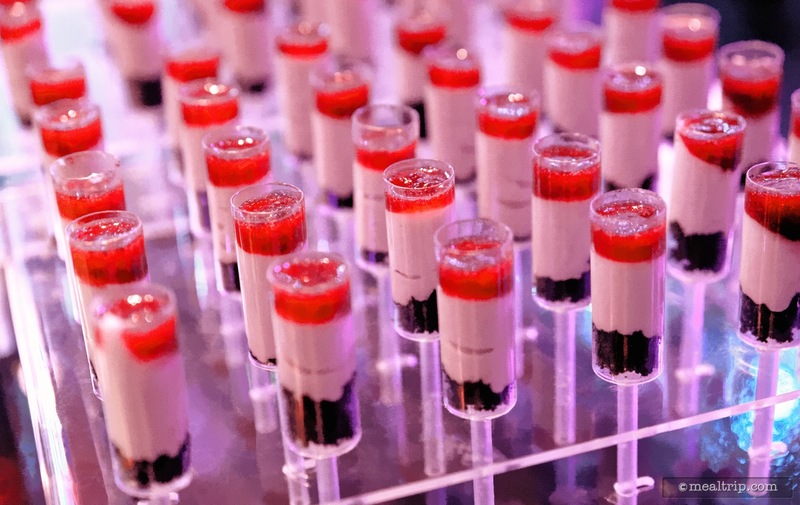 The Red Wine Cheesecake Pushups with Dark Cherry Gel are held in place at Maleficent's dessert station with the help of an acrylic block. 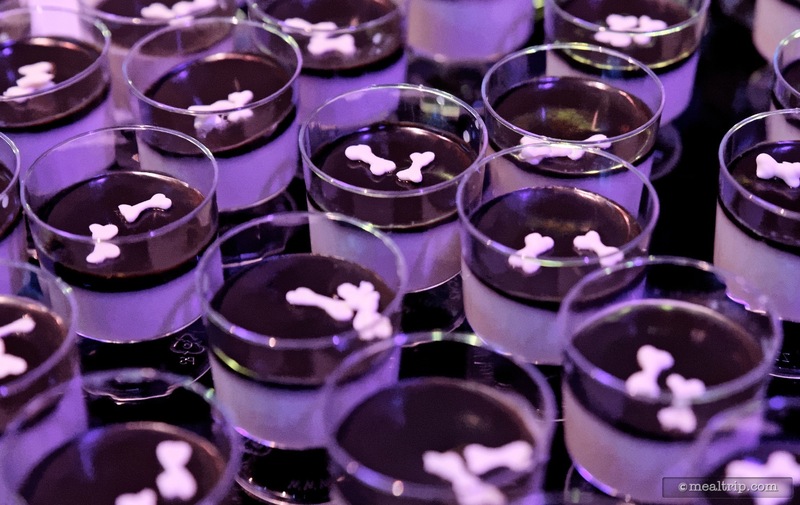 Cruella De Vil's "White" Panna Cotta with Black Chocolate Sauce and Mini White Dog Bones is actually white... to say there were a lot of purple lights in the room... would be an understatement! 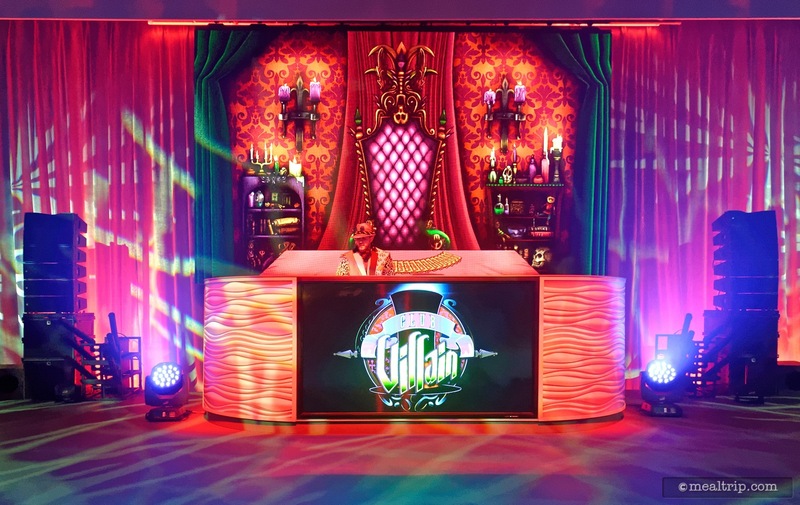 The Villains at Club Villain were available for meet and greets and photos at their stations located on each side of the room, and they were in the show as well. 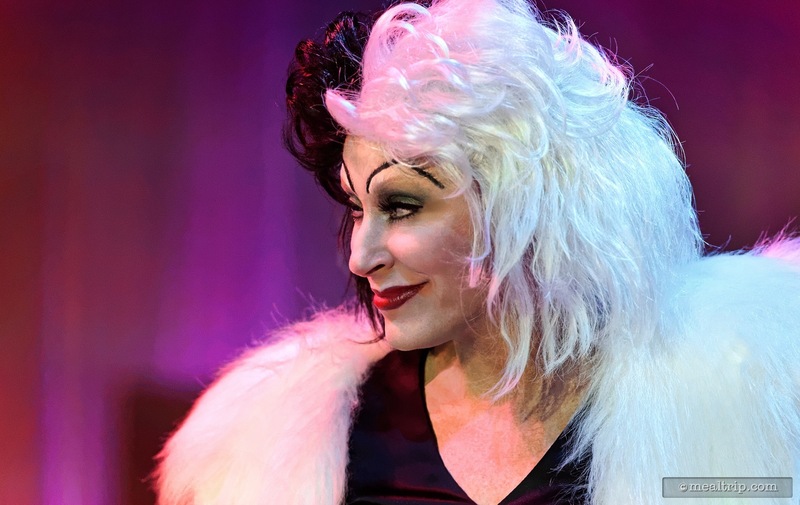 Pictured here, Cruella De Vil. 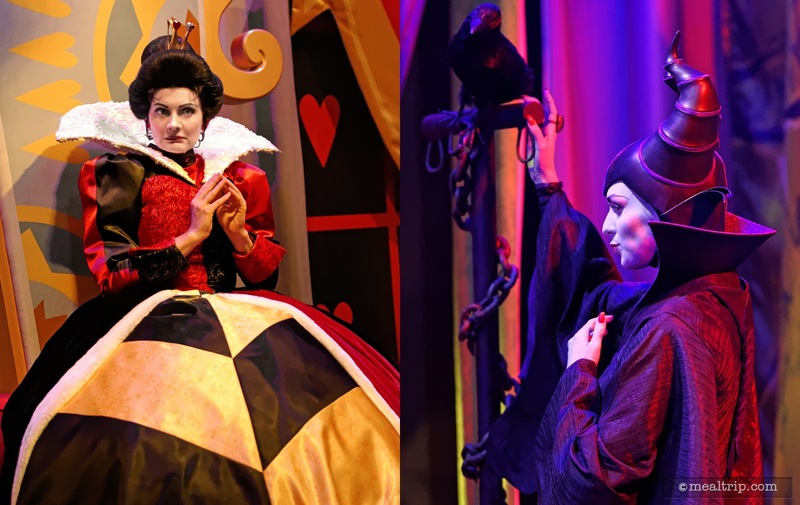 The Queen of Hearts and Maleficent are on opposite sides of the main room. 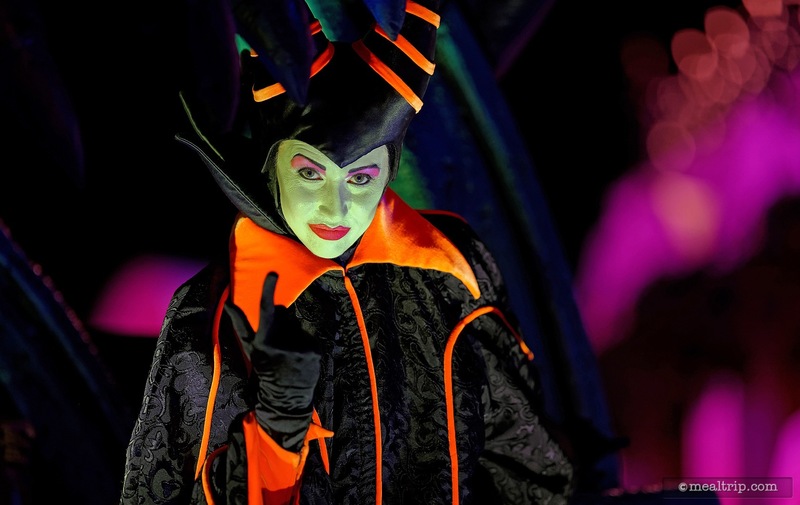 Maleficent enters the Club during her "intro" number. 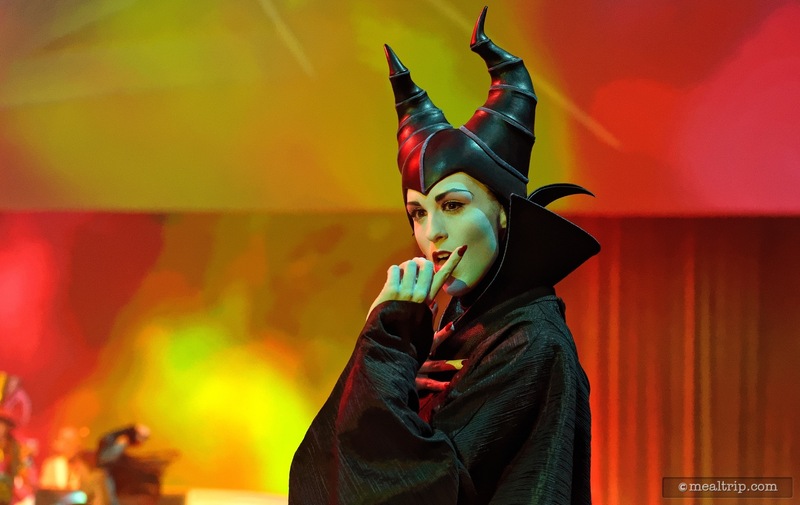 Maleficent has her eye on a guest. 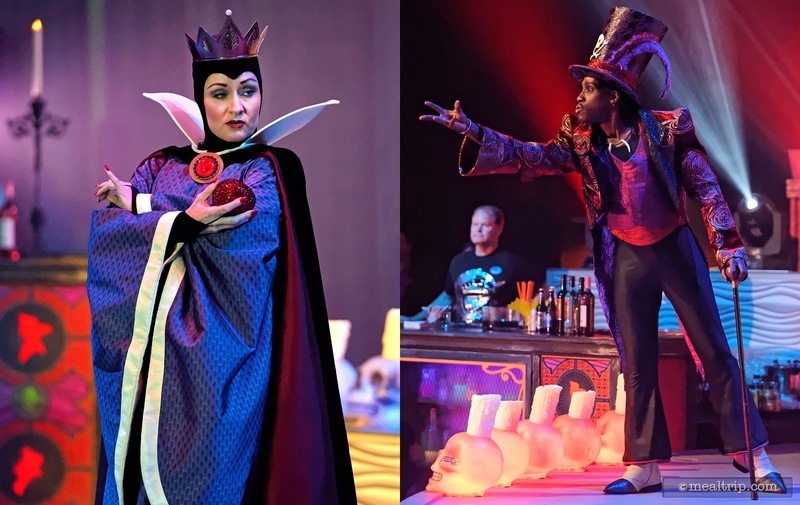 The Evil Queen walks out with a jewel studded apple, as Dr. Facilier introduces each Villain. 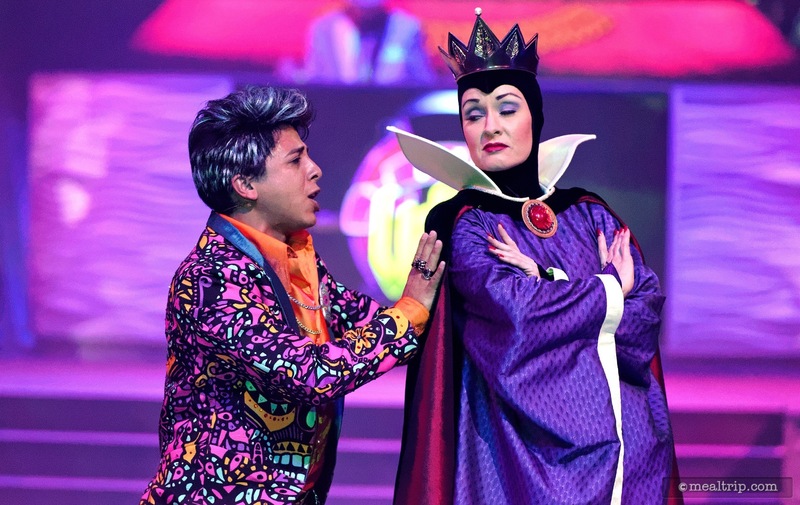 The Queen of Hearts is going on about something as the stealthy Maleficent watches quietly. The meet and greet sets are amazing! 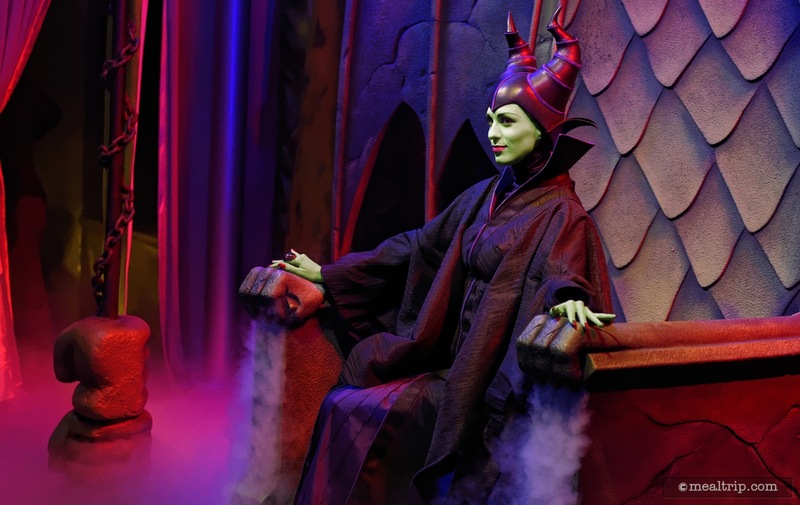 Here, you can see the smoke actually pouring out of Maleficent's throne! 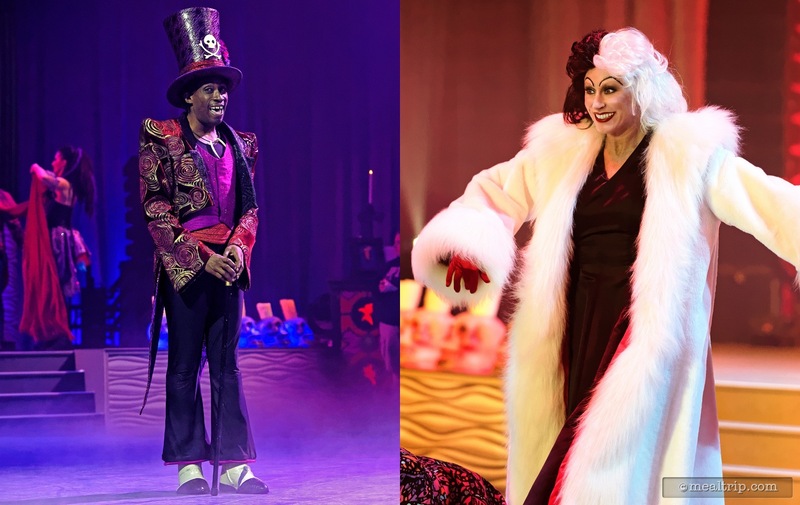 Dr. Facilier and Cruella De Vil at Club Villain. 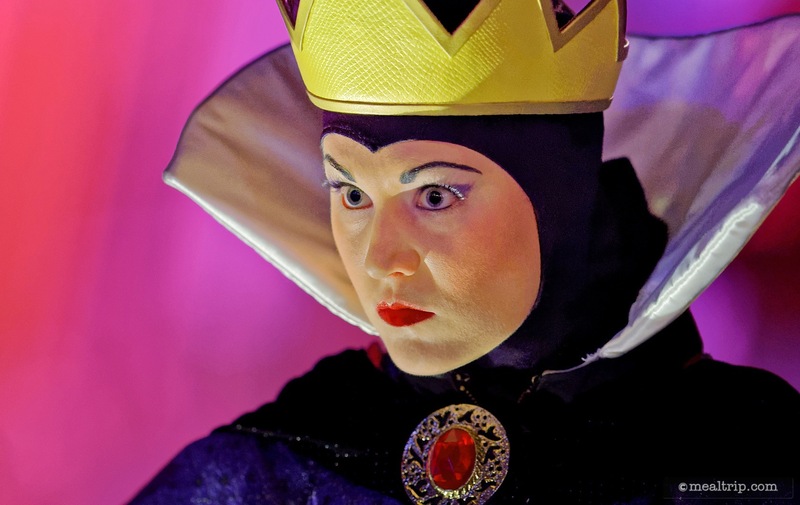 The Evil Queen even brought out her mirror to the photo meet and greet area! 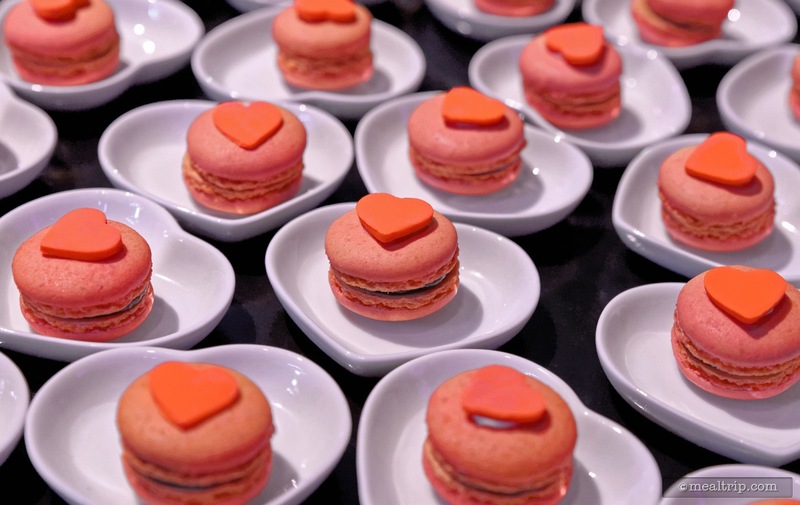 Red Macarons with Red Hearts from The Queen of Hearts dessert station. 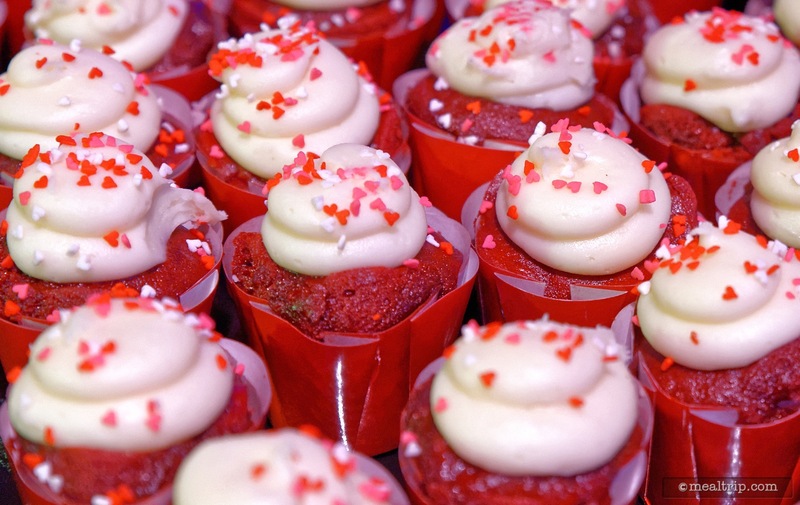 Red Velvet Cupcake with Heart Sprinkles from The Queen of Hearts dessert stations at Club Villain. 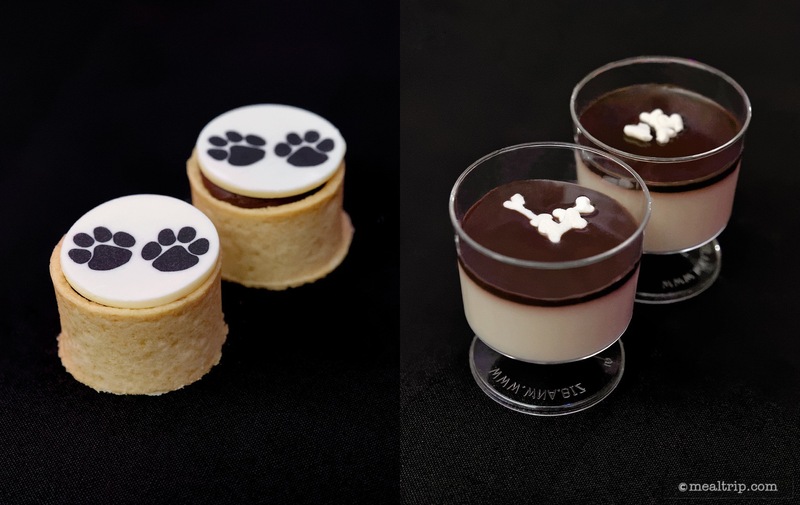 White Panna Cotta with Black Chocolate Sauce and Mini White Dog Bones and a Chocolate Tart with Paw Print Coin from the Cruella De Vil dessert station. 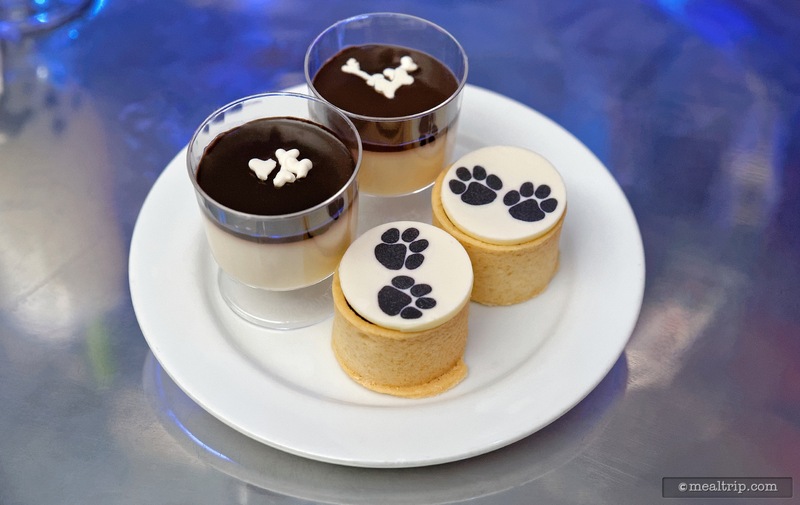 Chocolate Tart with Paw Print Coin and the White Panna Cotta with Black Chocolate Sauce and Mini White Dog Bones from the Cruella De Vil dessert station. 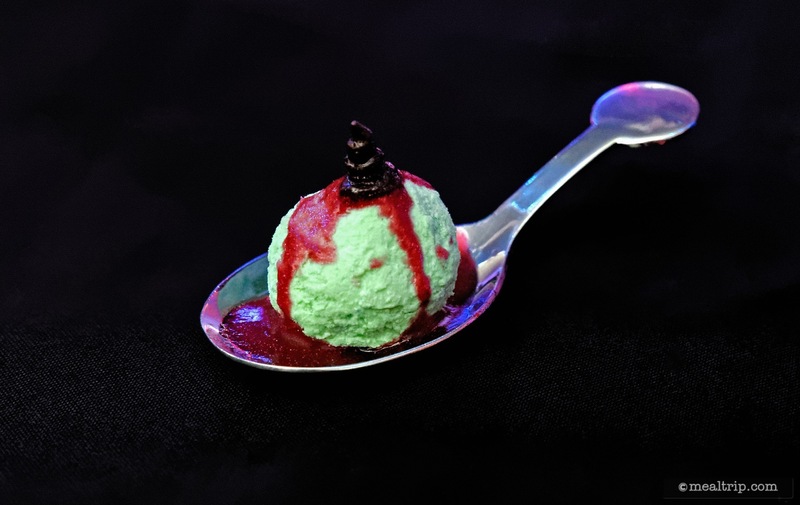 Green and Red Truffles with Apple Stem on Spoons from The Evil Queen dessert station. 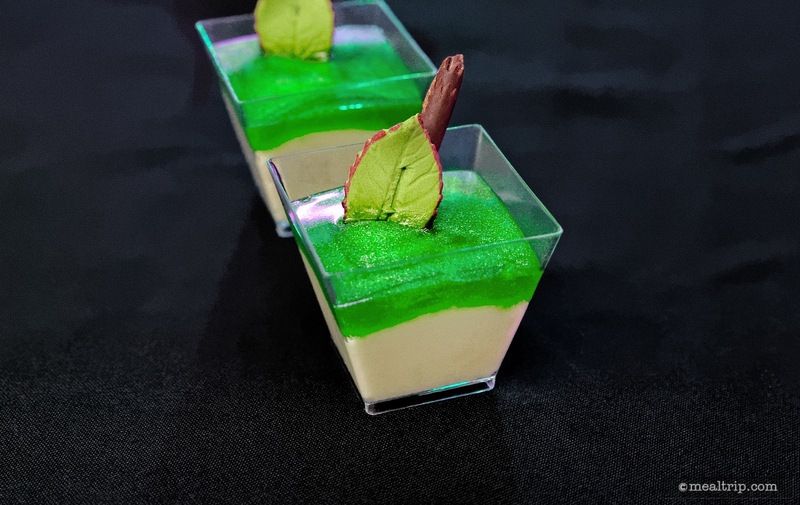 Green Apple Mousse with Green Glitter Glaze, Leaf and Chocolate Stem from The Evil Queen dessert station. 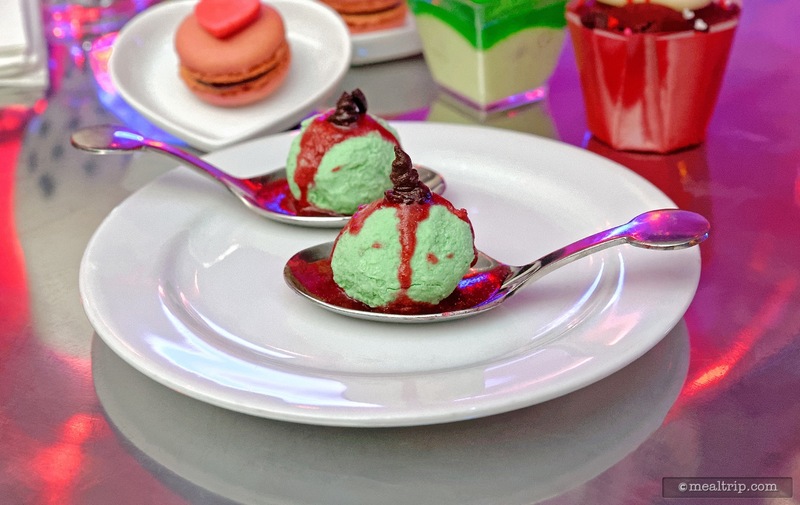 The desserts at Club Villain were all of the "mini" variety, but that didn't mean they were small on flavor. 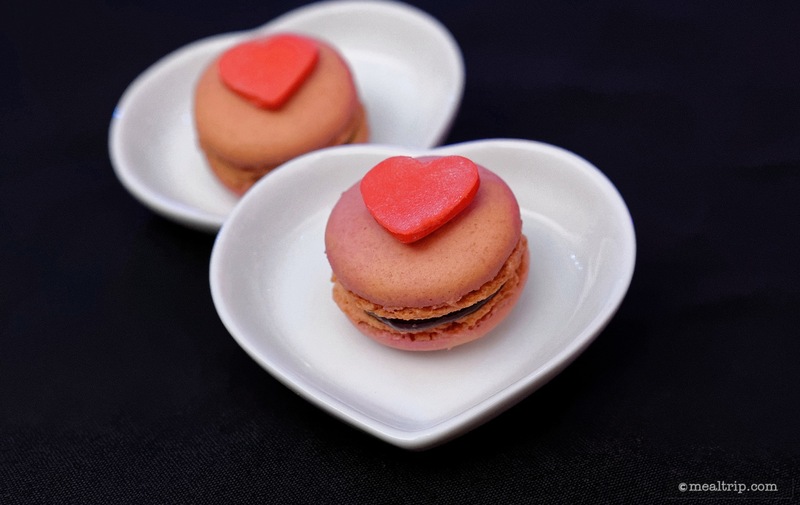 These Macarons were dense, sweet, and rich. 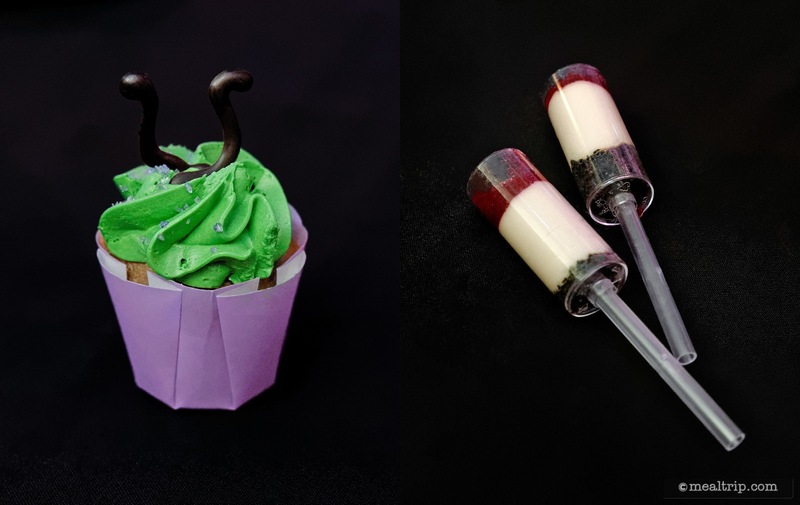 From the Maleficent dessert station, a Purple Angel Food Cupcake with Chocolate Evil Horns and two Red Wine Cheesecake Pushups with Dark Cherry Gel. All of the desserts at Club Villain were all you care to eat! 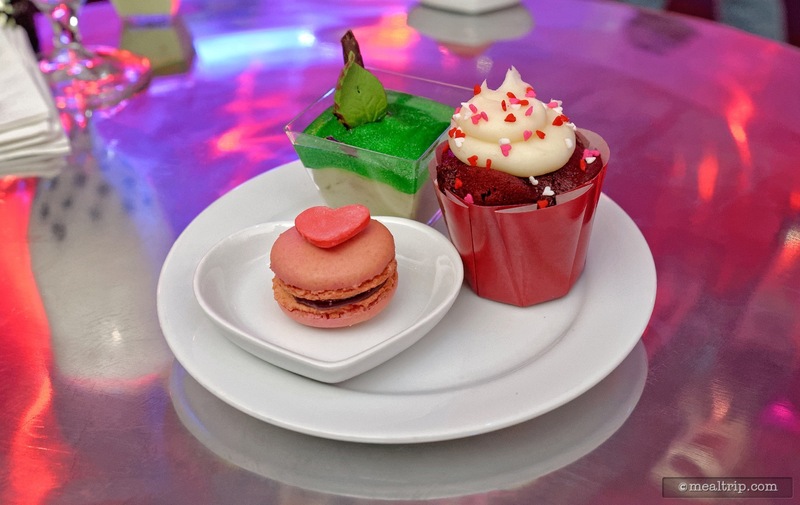 Pictured here is a Red Velvet Cupcake with Heart Sprinkles, a Red Macaron with Red Heart, and a Green Apple Mousse with Green Glitter Glaze, Leaf and Chocolate Stem. 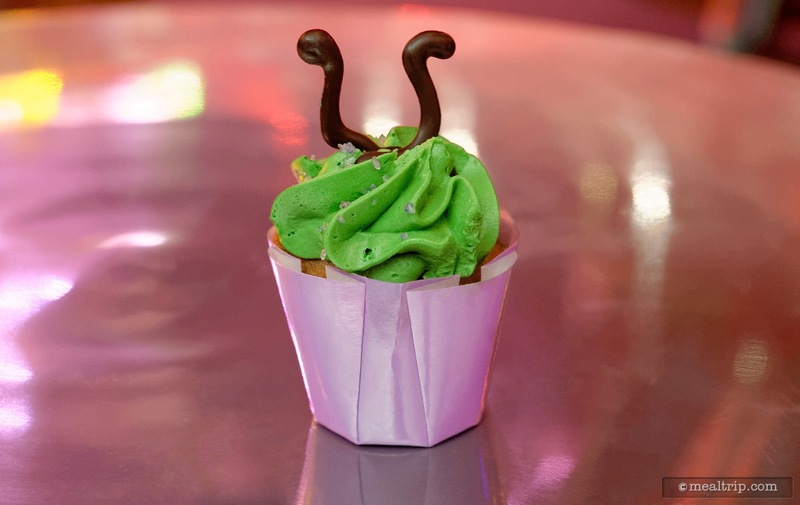 A Maleficent cupcake of course! 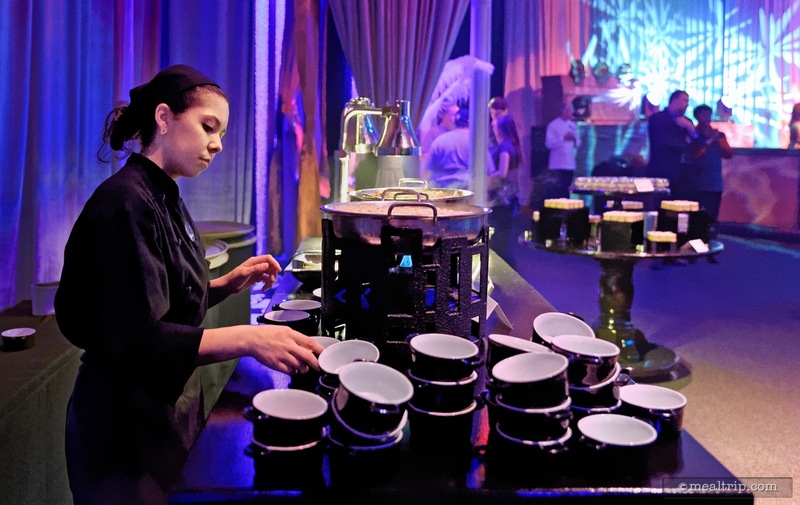 All of the desserts at Club Villain are very good, and quite a bit more original than what we've found at a few other dessert parties. 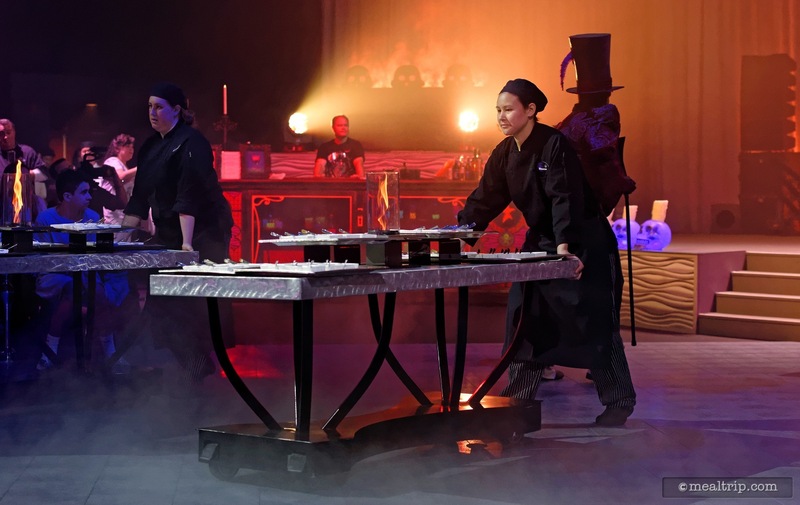 Just when you thought dessert was over, Dr. Facilier and Kanzo instruct the culinary team to roll out the Creme Brulee! 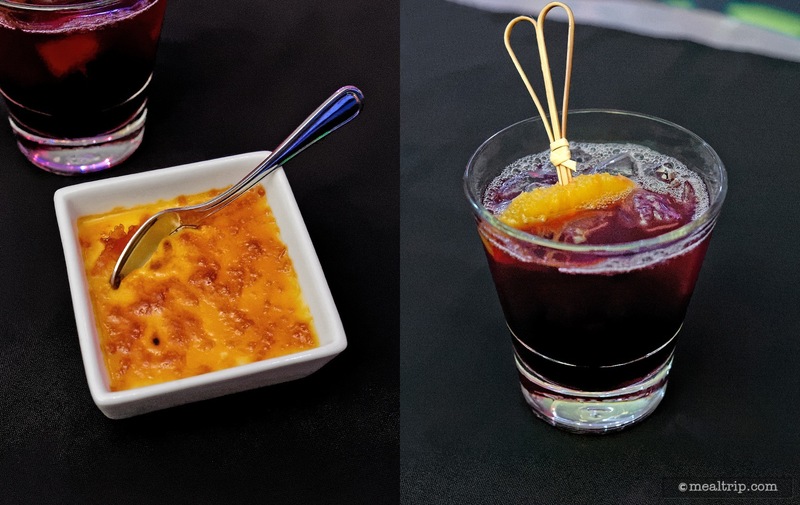 A close up of the Creme Brulee and (for no "culinary" reason) a "Bleeding Heart Sangria". 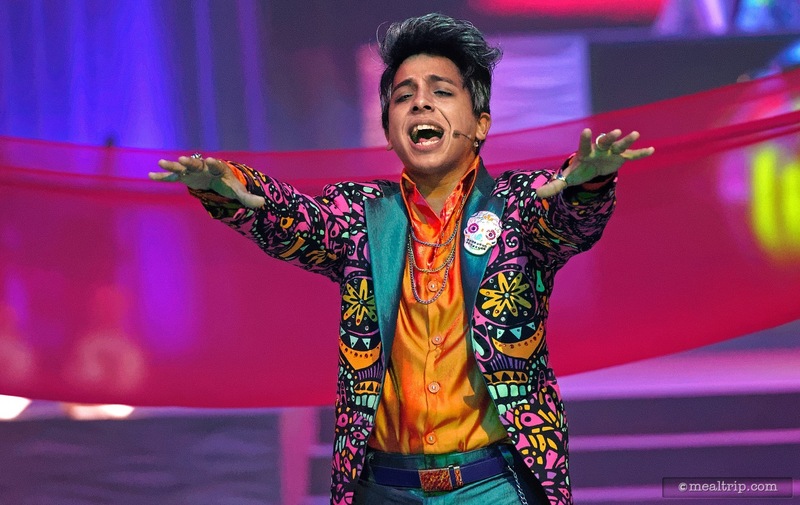 The manager at Club Villain is Kanzo, he's not just the narrator that moves the show around, but a top-notch singer as well. 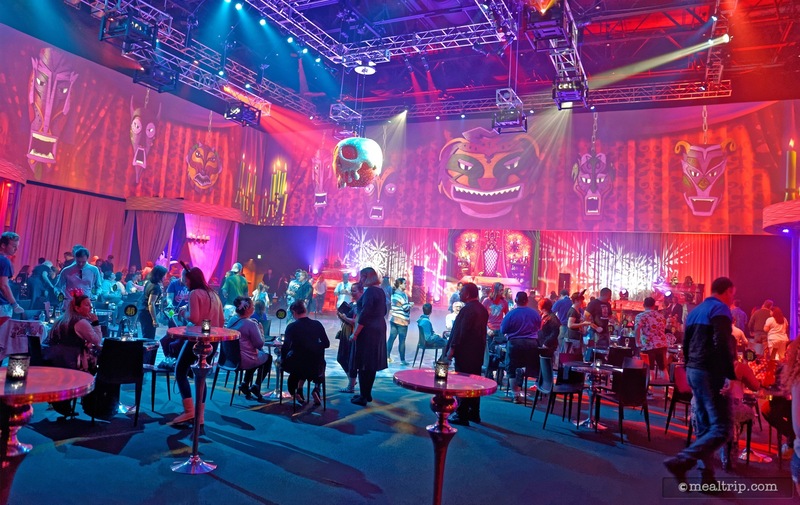 The center stage area in Club Villain is at ground level, so you really get a sense of being "in" the action. The Voodoo Ladies have dance routines just about everywhere. They might even dance with you! Oh yeah... they dance AND they sing! The Voodoo Ladies are pretty awesome!!! 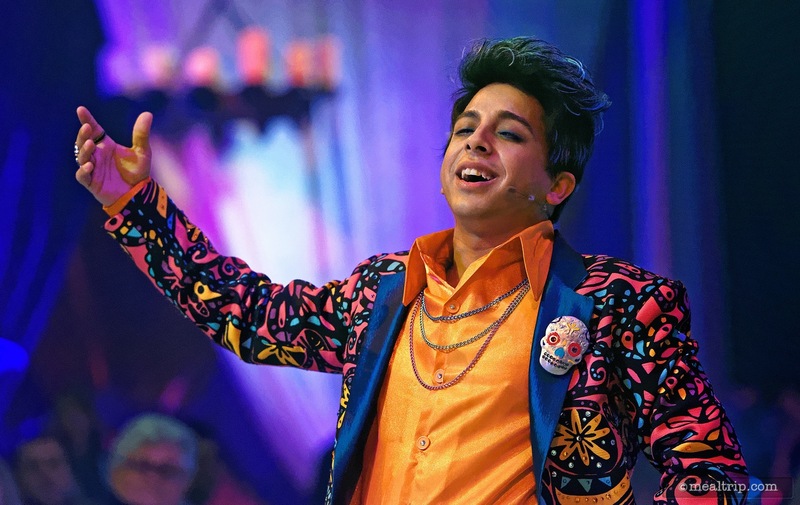 There are several well-paced and timed song and dance numbers that happen throughout the evening. The Voodoo Ladies providing more eye candy!!!! 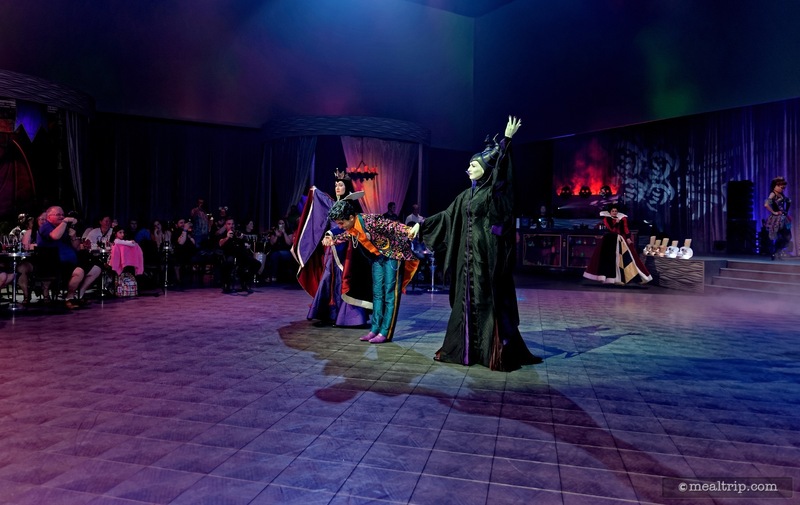 Kanzo pleads with The Evil Queen to take part in the show at Club Villain. Okay guys, if you were thinking the "show bits" were going to be boring and you could use the time to check your email... think again!!! Club manager Kanzo belts out one last number before the night draws to a close. Hey... the Voodoo Girls can sing!!! 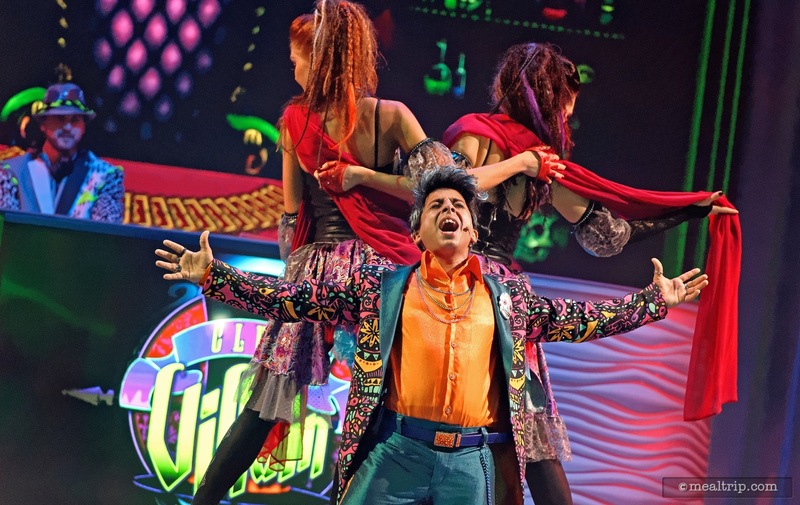 Top-notch style, costuming, show-flow, performances, and lighting ... Club Villain is the real deal! 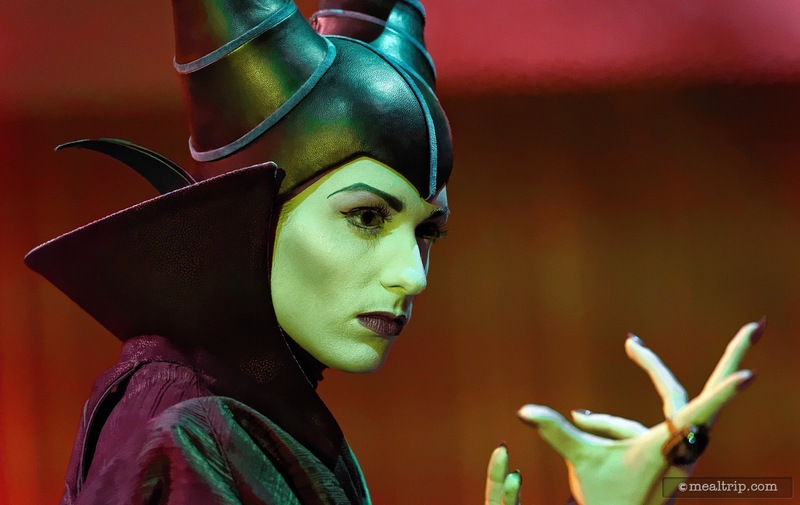 This is a promo photo of Maleficent that we used when talking about the new Club Villain before it opened. This shot was actually taken during Mickey's Not So Scary Halloween Party! 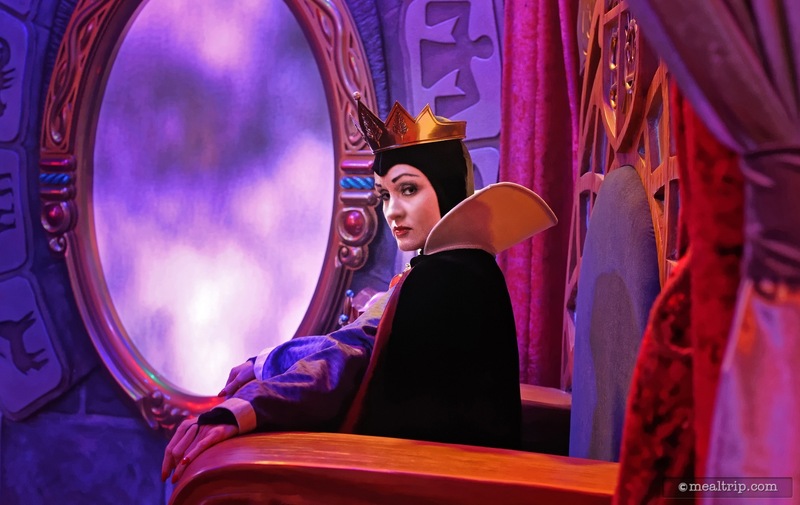 We also used this photo of The Evil Queen when talking about the new Club Villain at Hollywood studios. 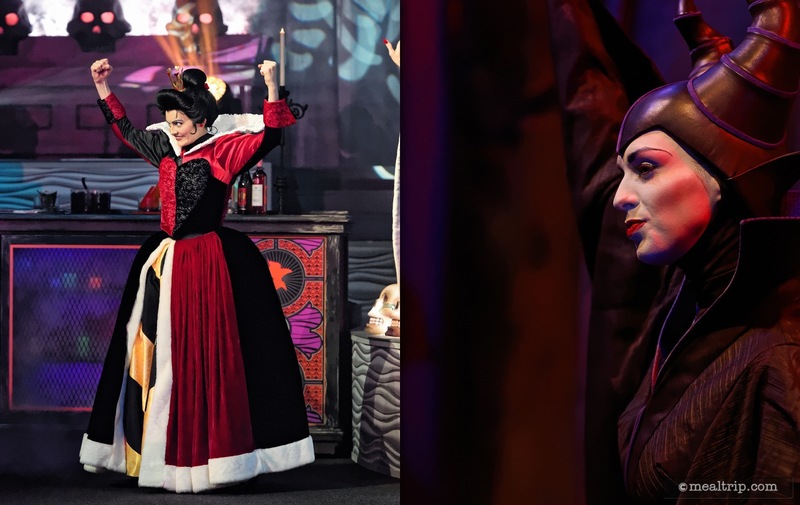 This "Evil Queen" was also taking part in the "Boo to You" parade during Mickey's Not So Scary Halloween Party at the Magic Kingdom.